How fitting that Wake County high school students and their guest students from around the world should volunteer on Sept. 19th, just two days before the International Day of Peace celebration! 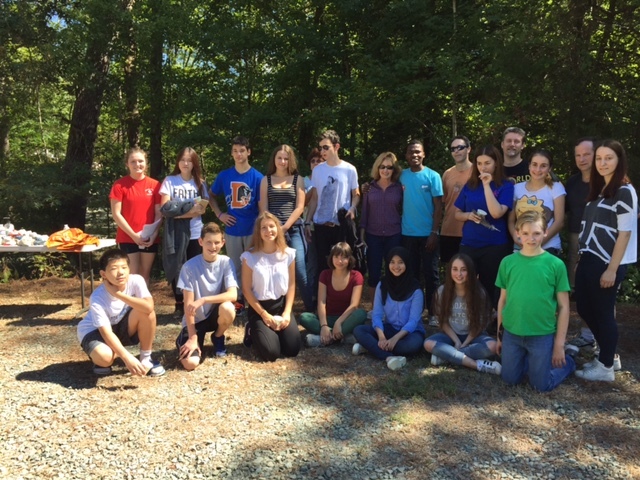 Sherri Brown, the Wake County coordinator for the American Cultural Exchange Service (exploretheworld.org), brought 13 international students, their host students and parents for a morning of community service. The guest students were from Slovakia (2), Serbia (3), Bosnia, Herzegovina, Germany(2), Kenya, Russia, Indonesia and South Korea. After a long hike through the woods bordering Stinking Creek, the group reached a huge mess of trash near a large cove facing out toward the Haw River Arm. They collected about 15 bags of trash and a couple of tires. The students felt their work made a difference and clearly, they all enjoyed working together while furthering international understanding. It would be interesting to know what the visiting students say about trash in the U.S. in their next email back home!